What I love about CES is that we get to see a lot of cool products from traditional companies who are otherwise shy about launching quirky products. At CES every company is ready to break the shackles and test out their creative ideas. It’s only Day 1 and we have already seen some cool and crazy products. There’s a smart foldable scooter, some really cool audio products, laptops with built-in Alexa, Nvidia’s Big Format Gaming Display, and a foldable 65-inch TV from LG, among others. Well, today Nokia also joins the fold as the Finnish company released its first ever sleep tracking smart mattress pad. Well, although a sleep mattress pad is an unorthodox product from Nokia, I am not that much surprised considering the fact that the company acquired Withings in June of 2016 for a whopping $190 million. For those who don’t know Withings was a company which focused on creating health and fitness-focused gadgets. Still, it’s a little bit surprising to see Nokia launch a totally new product rather than integrating Withings’ technology in the existing product portfolio of smartwatches and smartphones. But, as I said, it’s that time of the year when companies are showing off their technological prowess and innovations. The Nokia Sleep, the smart sleep mattress pad has built-in sleep tracking feature. The pad slides under your mattress and tracks your sleep to give you a detailed look at your sleeping pattern. The pad is connected via WiFi and syncs all the data to Nokia’s Health Mate app. In addition to tracking your sleep, it also tracks your snoring pattern and gives you a daily sleep score. The sleep score is an easy way to see if you had a good sleep or not. The best part about using the Nokia Sleep is that it connects to various other services like Alexa and IFTTT. If you are using Alexa controlled smart home devices, you can just ask for your sleep info and Alexa will shout it out to you. You can also use IFTTT integration to perform different functions. For example, you can set it to dim your smart-lights when you fall asleep or turn them on when you wake up. 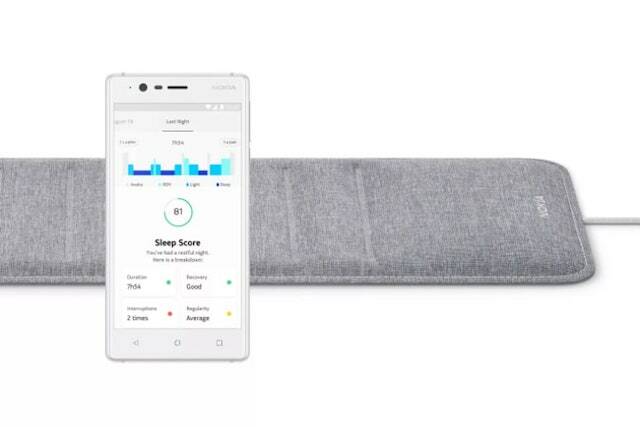 The Nokia Sleep is expected to ship in the first quarter of 2018 and is priced reasonably at $99.95.